Thank you to the Dane County Sheriff's Office, and to Harley-Davidson of Madison for organizing this year's ride! 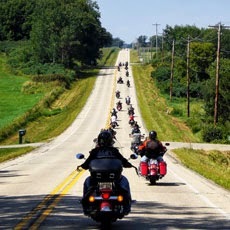 This 100-mile ride through Dane County has become a favorite of area motorcycle enthusiasts. The ride winds through scenic portions of Dane county with a stop in Poynette as a midway point. Food and beverages will be available following the ride. Participants will receive a commemorative t-shirt. Day of Registration: 9:00 a.m. - 11:45 a.m.
Raffle Tickets are $10 and only 1,500 tickets will be printed! The drawing will take place on June 30th at 5pm at the Ron Boylan Motorcycle Ride Finale. Winners need not be present to win. All ticket proceeds go directly to Safe Harbor.